A Neighbourhood Plan had been an agenda item at numerous Parish Council meetings going back to 2013. The Parish Council produced a questionnaire in February 2014, which was circulated to every premise in the village to gauge opinion on the possible development of a Plan. There were a total of 150 responses to the questionnaire. A large majority supported the Parish Council’s proposal to go ahead: 139 in favour, 6 opposed and 5 not answering the question. Execution was not immediate because at the time support from the Planning Department of the South Cambridgeshire District Council was uncertain. The process was resurrected in 2015 when the Parish Council requested designation for the parish of Whittlesford only in March 2015. 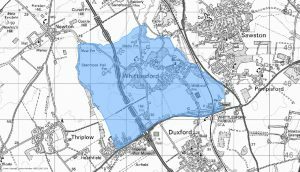 Consultations had taken place with Duxford, Pampisford and Hinxton Parish Councils to establish if a joint designation would be appropriate. It became clear that whilst there was some common ground, there were many aspects unique to Whittlesford which the Council believed needed to be enshrined in a Neighbourhood Plan exclusive to our village. The M11 passes through our western flank, the busy cross country trunk road, the A505, defines our southern boundary, to the north we face Greater Cambridge, and to the east, the A1301 with its potential for life science developments. The village is host to Whittlesford Parkway station, which presents its own challenges. Developers are already submitting applications for potential sites, and since much of the village is within the Green Belt, there is a requirement for us to define the extent of house building in our Parish. Whittlesford is an expensive place for house buyers, which increases the importance of providing affordable housing for younger families with local connections and suitable housing for older residents wishing to down size but stay in the village. Whittlesford was one of the original Hundreds of Cambridgeshire. A settlement, dating back to the Iron Age and through Saxon times, was discovered near the Church and is now a site of much archaeological interest. All part of a heritage we are keen to protect. A well-attended public consultation meeting was held on Tuesday March 1st 2016 in the Whittlesford Memorial Hall. This had been publicised in the February edition of LOOK, the village magazine that is circulated free to all residents. The March edition contained a follow up, listing the panels set up on that evening and encouraging more people to sign up – Parish Wide Issues Employment Environment Leisure & Community Open Space Housing & Commercial Development Transport & roads. This has developed into four groups Housing and Commercial Interests, Transport and Infrastructure, Community Assets and Environment and Heritage. The Neighbourhood Pan is now a regular agenda item of our monthly Parish Council Meetings (PCM), minutes published on four noticeboards, Facebook and a specific section on our website (http://www.whittleweb.org.uk), and referred to in ‘Notes from the PCM’ in the village magazine. We have also recently set up this neighbourhood plan website. Our local press correspondent also ensures it is highlighted in her articles for the Cambridge Weekly News. We are supported by The Whittlesford Society, founded in 1975 to: stimulate public interest in the village and its environments; promote high standards of planning and architecture; secure the preservation, protection, development and improvement of features of public or historic interest in the village and adjacent areas.